Donna's studio is located in Hueytown, a suburb of Birmingham, Alabama. 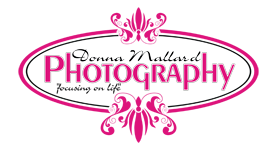 In business for almost 20 years, Donna loves all aspects of photography while specializing in children and pageant photography. Her photographs have won local, state and national attention at all levels of competition. Donna has had the privilege to photograph several Miss Alabama, Miss Georgia, and Miss Tennessee winners and has photographed individuals from all over North America. She holds photo shoots in studio and on location throughout the United States. Donna works with a varity of hair and make up artist that have been involved in pageantry for many years and are well known for there talent and creativity. Donna is best known for her ability to create a rapport that draws the client in and allows not only the subjects beauty but also the essence of their personality to be captured through her camera. Donna is married, lives in Pleasant Grove and has two daughters, Evan and Kinsley, that were her inspiration in starting her business. She now has a granddaughter Gracelyn and grandson Easton whom she just loves to photograph. Contact us for further information.